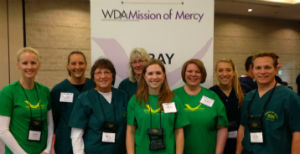 WDA Mission of Mercy 2014 volunteer team from Dentistry by Design. This year marks the sixth WDA Mission of Mercy. Since it’s inception in 2009 over $7.1 million in care has been administered and over 13,000 patients treated. Dentistry by Design had eight team members volunteering, providing both dental care and administrative support. This is an event our team looks forward to every year. It is such a great feeling to be able to serve in the WDA Mission of Mercy event. We are humbled by the outpouring of gratitude and are overjoyed seeing the many smiling faces. Following is a great video which shares the stories of some of the patients who were treated and volunteers who served.